A new season is almost upon us Nonetheless, the time has come to take stock of the forthcoming trends and start plotting your wardrobe for the coming season. This summer fashion trends are nothing if not bright, bold and really quite beautiful. In fact, it was a show season full of actual fashion moments. As we get ready to usher in summer, it’s also time to usher in a cool set of trends. The street style outlook, and the best-dressed A-listers, these are the rising fashion trends to look in this season. Art and fashion intersected on summer 2018, making for a colorful and rich way to shake up any wardrobe. 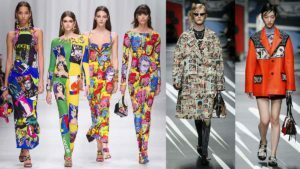 From the bold Warhol-inspired pieces at Versace to cartoon works of art emblazoned on summer collection, art is most wearable in 2018. Maxis are free and not tight at all, the material is light and great for summer. It is a wonderful outfit for summer 2018; do not be left behind by this trend. 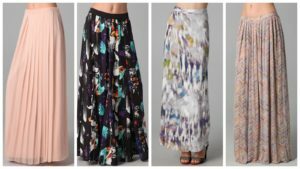 Maxis can be worn by every women despite the body size. They are also appropriate for the beach visits you will be probably making. 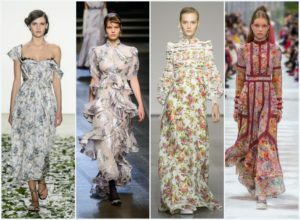 If you have no floral dress in your closet, then it seems that you have been left behind by what’s new in the fashion trend. It would be great to have a floral outfits that fit you and wear them during summer time. The outfit can be used for a party, Wear it and look elegant in summer time because you really are entitled to it. Pointed toe pumps will combination the outfit perfectly, but all this relies on the color of the outfit. Another iteration of the maximalist mood – major statement fringing, swishing across necklines, hemlines, bags and these are no wishy-washy boho trims. 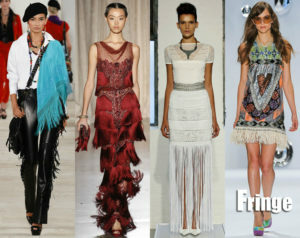 Making for one of the most fun trends of this season, Fringe is back and more over-the-top than ever. 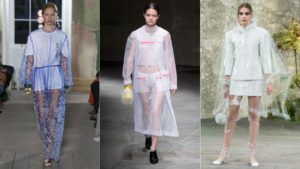 For those looking to attempt the latest trend, it’s already surfacing on skirts, and playful trimmed tops for a more subtle way to embrace the look. 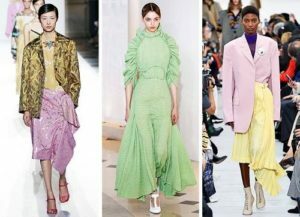 On the flipside, but still just as punchy, you’ll find mix ‘n’ match ultra-pastels being adopted everywhere from New York to London and back again. Hippest when worn together in the weirdest combos possible. 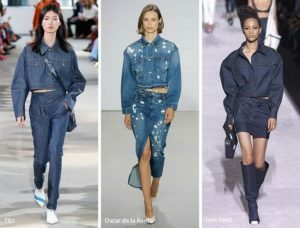 Nothing new on first look, denim is not often on trend. This summer, however, there is no such thing as too much. Double denim. Triple denim, why not accessorise via a denim hat? You have our word that it’s a good look. 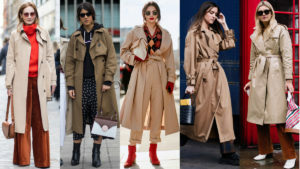 Deconstructed, ballooning, cinched-in this summer sees the iconic trench coat take on a whole manner of forms. The classic trench coat gets a fresh upgrade after being reworked in an endless amount of iterations. From new cuts to feathers and ruffles, there’s a fun new trench for everyone to try this season. 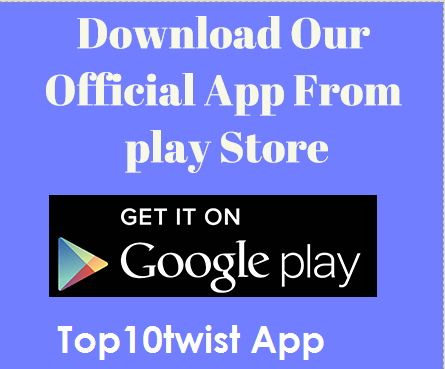 There are ways to embark upon this trend in a way to suit your style. Alexander McQueen showcased harder, more substantial ruffles, whereas the ethereal likes of Preen and Giambattista injected the trend with their signature delicate fragility. 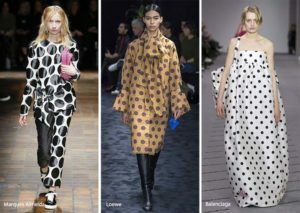 Carrying on from this year’s polka-dot popularity, you will find many a spotted item heading into stores for 2018. Keep it monochrome and keep it in cool, modern shapes to avoid looking like a 1950s housewife. Wondering the latest way to style the look?